I love to try new thing, so last night I picked up some red jasmine rice and cooked it, not really knowing what I would do with it, so this morning I came up with this. It’s a pretty simple salad to make but very pleasing to the eye and satisfying if you want a quick something to eat for lunch. I will have this for lunch with a side of baba ghanoush which I made last night. Hope you like it. *note: I used the Vidalia chopper small grid to get uniform cubes. It’s fast and looks pretty especially if you are making this for company. You can get it at bed, bad and beyond with a 20% coupon for about $15. 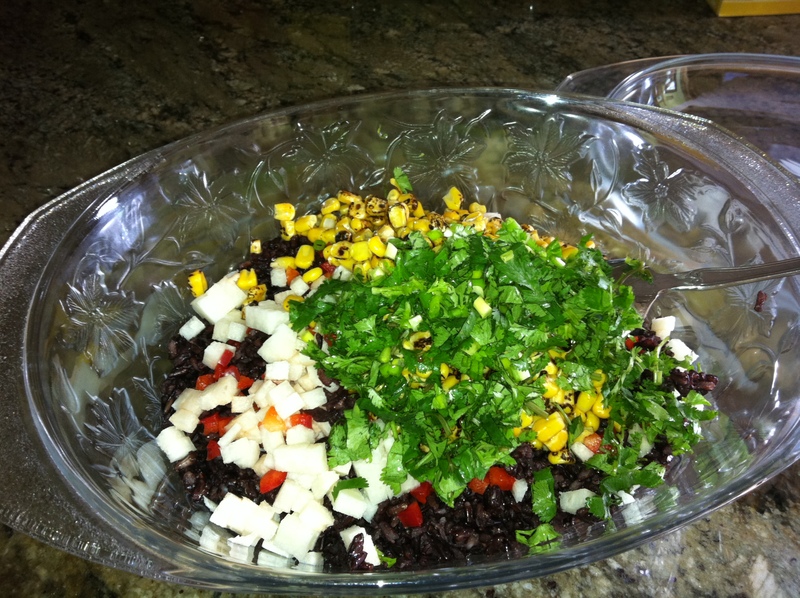 once you have mixed the dressing, toss it into the salad and let it marinade for a few minutes before serving. Enjoy! So today to my great excitement I saw this beautiful fruit in the market and of course I had to not only buy it, but discover all I could about it. The peel came off pretty easily once you cut into it. the flesh is mostly water, sort of like a watermelon but a little more dense. It has small sesame size back seeds that are easy to chew and don’t interfere with eating the fruit. 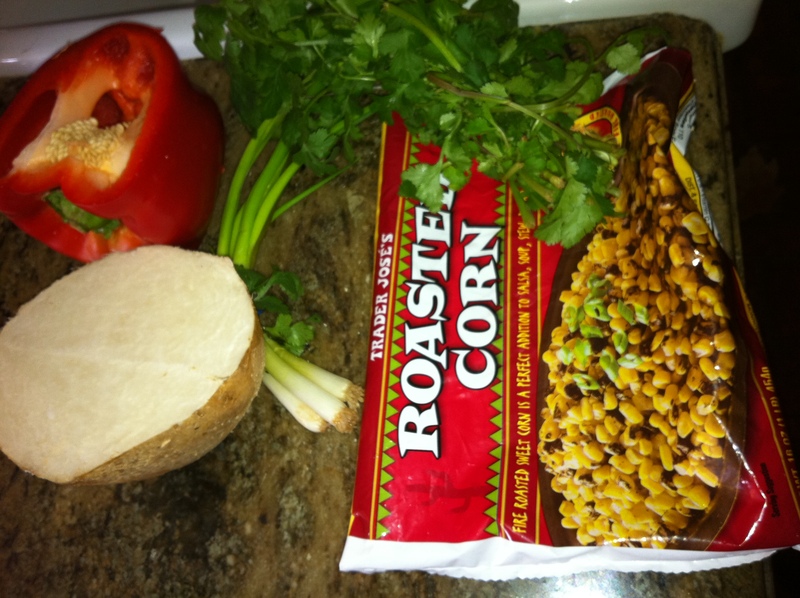 It has a mild sweet flavor and very refreshing to eat. It’s definitely one of my new favorites. I’m going back tomorrow to get some more while they have it. I bought then for 2.99 a lb. for 2 fruits I payed a little bit over 7 dollars, not bad for an exotic fruit like this. You can see the peel in the background, it just came off very easily. Dragon fruits are rich in antioxidants. They help to prevent the formation of carcinogenic free-radicals. Dragon fruits are packed with vitamin C. Vitamin C ensures bruises and cuts heal faster and helps improve the general immune system. Vitamin B2 acts as a multi vitamin to recover and improve loss of appetite. Vitamin B1 plays an important role in the production of energy as well as metabolizing carbohydrates. Vitamin B3 lowers bad cholesterol level and enhances the appearance of the skin by moisturizing and smoothing it. The seeds of the fruit contain high polyunsaturated fatty acids. Dragon fruits help excrete heavy metal toxins from the body. They help lower cholesterol and high blood pressure. Regular consumption of the dragon fruit works great for asthma and cough. Carotene helps maintain and equally improve the health of the eyes. The proteins from the fruit enhance metabolism of the body. 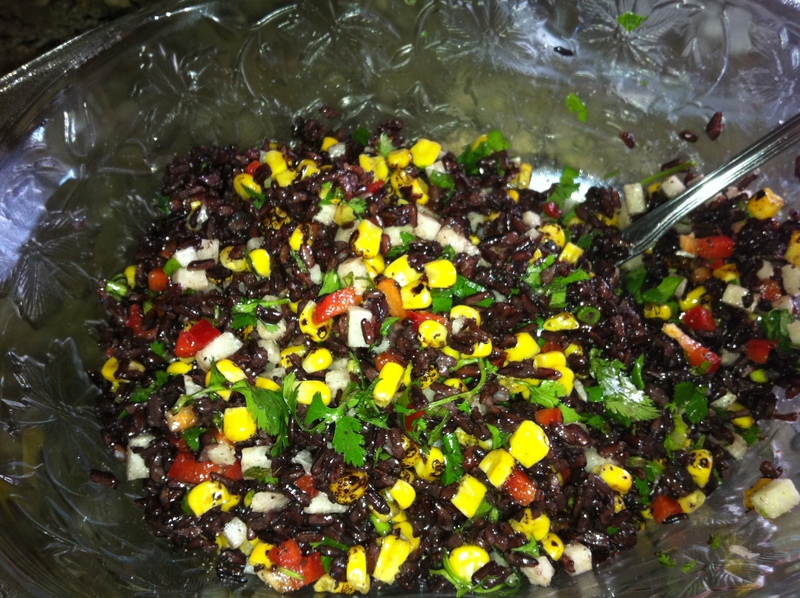 The fruit serves as a food substitute for rice, for the diabetics. Read more on fruits for diabetes. They protect the environment by absorbing CO2 at night and releasing oxygen to purify the air. Dragon fruit can be used as cosmetic and health material, with functions of improving eyesight and preventing hypertension. 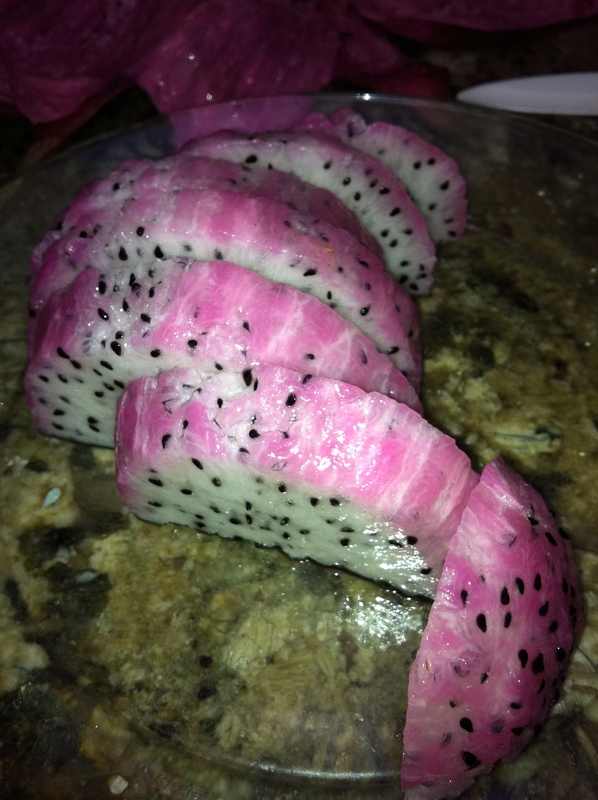 Dragon fruit can be cultivated easily. It has strong root and is good at water conserving, heat and drought resisting. So planting dragon fruit is low cost. Dragon fruits are rich in minerals, especially calcium and phosphorus. Calcium reinforces bones and helps in the formation of healthy teeth. Phosphorus aids in tissue formation. The fruits are low in calories and high in fiber. They help to avoid constipation by acting as natural laxative. 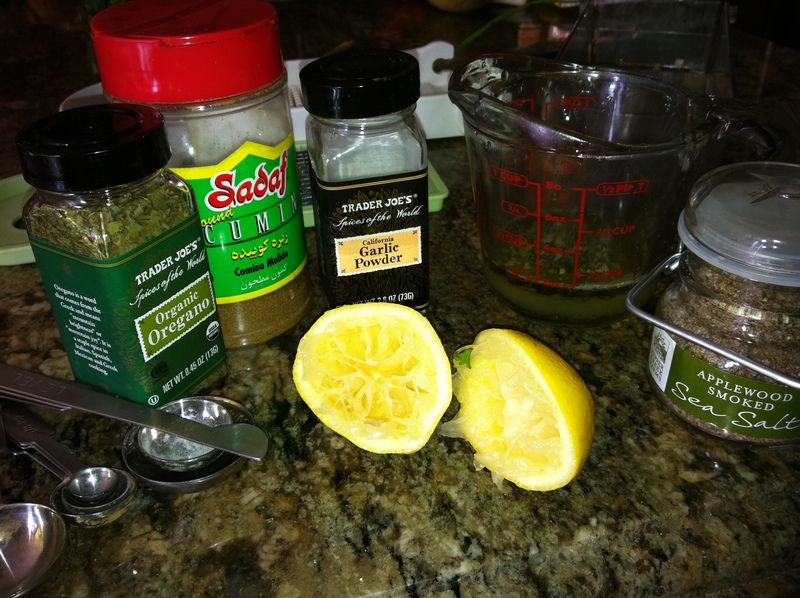 They help to improve the overall digestive health. The fiber enhances the digestion and reduces the fat. 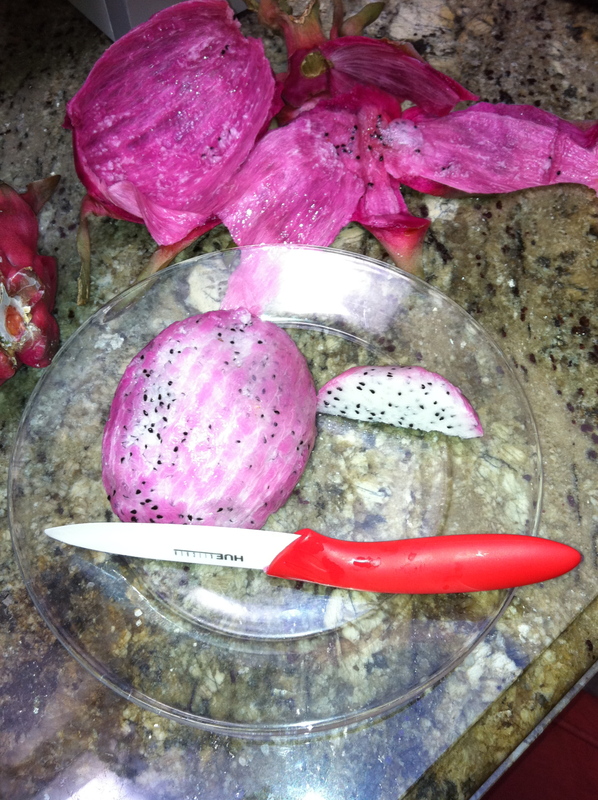 Consumption of 1.5 oz of a dried dragon fruit, equates to almost eating a full pound of the fresh dragon fruit. It is beneficial as all the necessary and important dietary fiber, micro nutrients and vitamin C are still in abundance in a dried dragon fruit. This was all about the dragon fruit nutritional value. Here follows the information about dragon fruit calories. 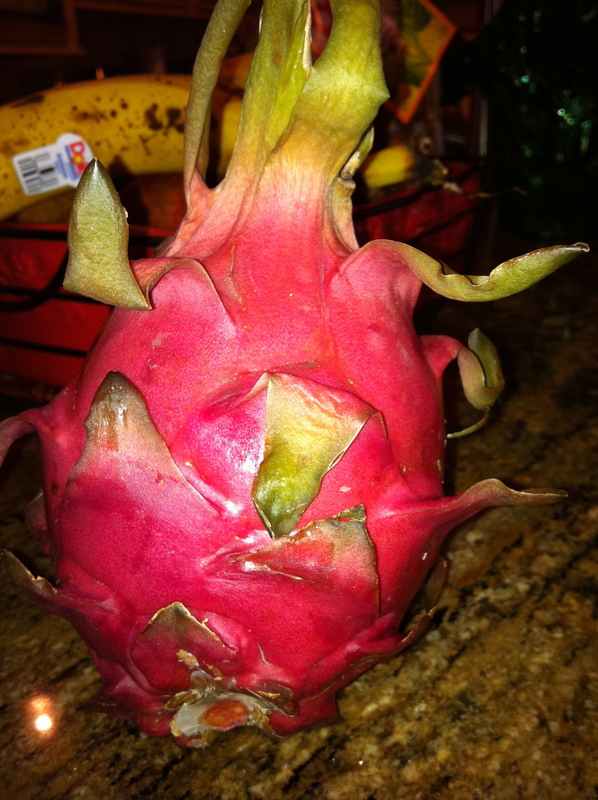 As seen above dragon fruit is low in calories. 100.0 gm of 1 tropical dragon fruit contains about 60 calories. So it can be included in weight loss diets. I hope the above information about dragon fruit nutrition facts helps you to make way for the new, aptly-named super fruit, the dragon fruit! Dragon fruit is the latest entrant to the world of super fruits. YAY! It’s time! 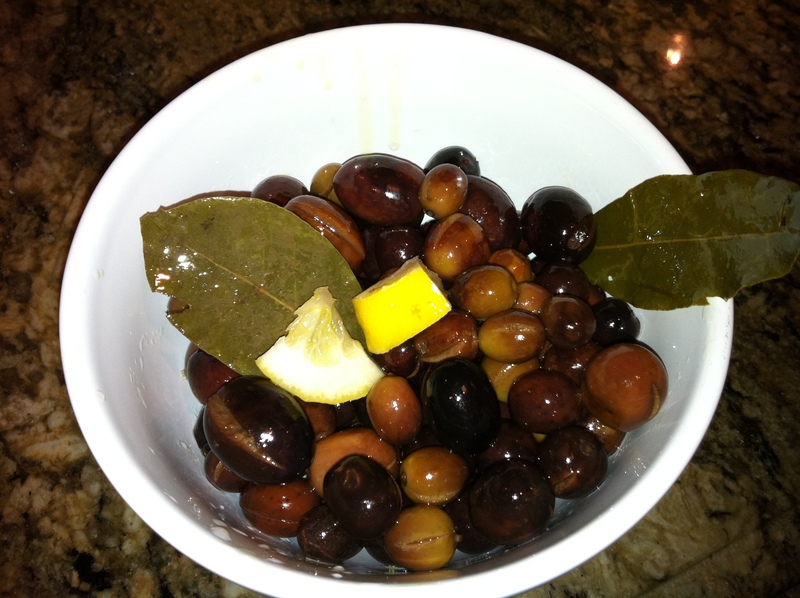 The olives are ready to be brined. I tasted a bit and the bitterness seems to be gone. All in all, it seems they only took 2 weeks of soaking in water to get rid of the bitterness, not too bad. 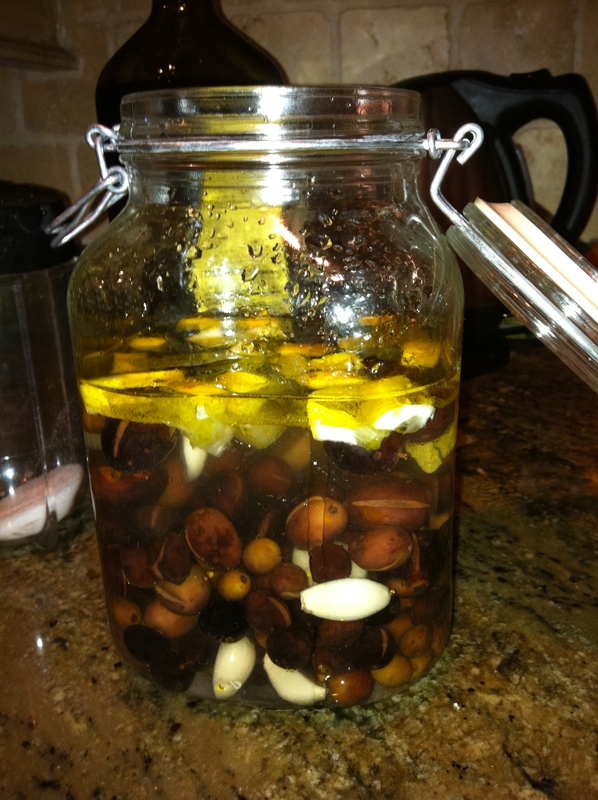 So after reading several ways to brine olives, I decided to just come up with my own combination. and covered the top with some extra virgin olive oil. it’s supposed to sit like this for about 2 weeks. AIM products America Asian Brine christmas Curing Olives Detox gifts giving gluten free grain free Green Smoothie holidays libyan low carb mango chutney masala mexican Noodles nut free pasta potatoes quiche Raw Raw Food Recipes red jasmine rice rice salad soup spinache Tahini Honey Dressing tomato vegan Vegan and Gluten Free vegan ground "meat"